You’re running late and only have time to apply ONE makeup product to your face (after you’ve applied your skincare, of course). What’s it going to be? Foundation, foundation and a bit more foundation just to be safe. I can cope with most things but if my blotchiness and spider veins are on display, I’m pretty grumpy. Vampy Varnish – Asks if a new Benefit mascara can really make people wonder if They’re Real. we heart this – is bubbly over one of Stila’s new lip glaze shades – Bubble Gum. Beauty Junkies Unite – wants to give you a fab Summer Prep Kit from Bliss, valued at $144…but you can’t win if you don’t enter! Clumps of Mascara – is absolutely loving Deborah Lippman’s newest nail polish shades . They are perfect for summer! EauMG – EauMG reviews one of the best lilac perfumes on the market, Profumi di Firenze Lilla. 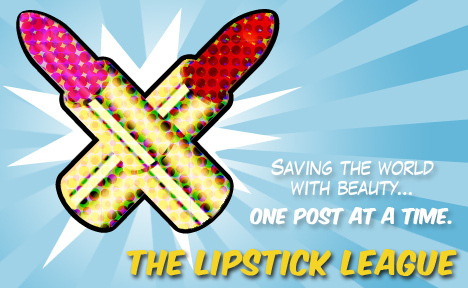 Lipglossiping – previews the upcoming Autumn/Winter collection from Butter London. Two seasons, five shades, you’re bound to ‘fall’ for one of them! Nouveau Cheap – gives you an in-depth review of the new CoverGirl Intense Shadowblast Primer + Shadow. The proof is in the pics! Orange to LA – shares the products in her May Favorites list. Bright eyeliners, and gold eye shadows- Just in time for summer! Pink Sith – Tortures it’s readers with their 5th installment in the Blushes You Can’t Have monthly series. This month Chanel Turbulent is flaunted! Phyrra – revisits Darling Girl Cosmetics. See how the company has changed and grown. Which product would you take the time to apply? I think I could just about get away without foundation or bronzer but mascara is a must have! First off kudos to you for getting away without foundation! I would definitely reach for the foundation and oh how i love my lashes when they are mascara-fied lol that would definitely have made the top 5 list! Wish I could get away without foundation or some cheek colour… look like I’ve been dug up without! I think the answer to that question will be foundation/tinted moisturizer for most people. It is for me. If you can get your base right, you’re halfway there! Foundation for me as well, before I switched to mineral foundation, I would have said pressed powder as without any powder the oils on my face have free rein to make my hair greasy more quickly. I <3 mineral foundation… in the summer I use it instead of a setting powder over a very light foundation. Ahh wish I could get away with just lipstick, lucky soul!